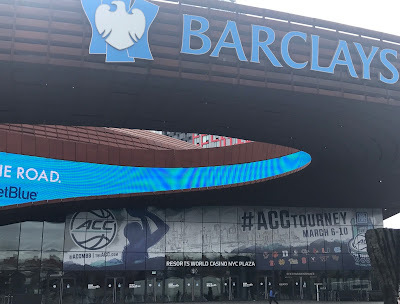 The Atlantic Coast Conference Tournament will be starting this Tuesday, March 6, at the Barclays Center. The conference announced the seedings and bracket for the tournament, which will run through Saturday night. Regular-season champion Virginia, who finished the regular season with a 28-2 record overall, including 17-1 in ACC play, will be the top-seeded team for the third time in five years and the fourth time overall. The Cavaliers will receive a double-bye into Thursday’s quarterfinal round, along with No. 2 seed Duke (25-6, 13-5), No. 3 Miami (22-8, 11-7) and No. 4 Clemson (22-8, 11-7). The tournament opens Tuesday with three first-round games. No. 12 Boston College (17-14, 7-11) faces No. 13 Georgia Tech (13-18, 6-12) at noon, followed by No. 10 Notre Dame (18-13, 8-10) versus No. 15 Pitt (8-23, 0-18) at 2 p.m. No. 11 seed Syracuse (19-12, 8-10) faces No. 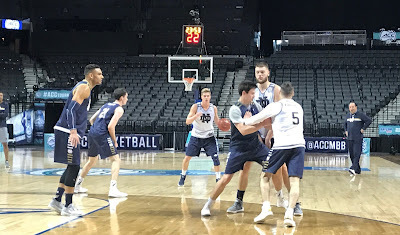 14 Wake Forest (11-19, 4-14) at 7 p.m.
Notre Dame practicing Monday at Barclays Center. Fifth-seeded NC State (21-10, 11-7), No. 6 North Carolina (22-9, 11-7), No. 7 Virginia Tech (21-10, 10-8), No. 8 Florida State (20-10, 9-9) and No. 9 Louisville (19-12, 9-9) will see their first tournament action on Wednesday. Florida State and Louisville will square off at noon, while NC State, North Carolina and Virginia Tech will meet the winners of Tuesday’s three first-round games. Wednesday’s winners will advance to face the tournament’s four top seeded teams in Thursday’s quarterfinal round. The ACC Tournament will culminate with a pair of semifinal games on Friday night and the championship game on Saturday evening. This year’s championship game is set for a primetime 8:30 p.m. start. Duke will enter this year’s tournament as the defending champion. The Blue Devils made history last year at Barclays by becoming the first No. 5 seed to claim the title and the first team to do so by winning four games. All 14 tournament games will be nationally televised on ESPN, ESPN2 or ESPNU and the ACC Network (ACCN). In addition, all games also will be available via ACC Network Extra.